Gout Treatment Plan for Patients is the intro to my guided gout treatment plans. So, you will find lots of examples of uric acid lowering plans that you can adapt for your personal use. I wrote Gout Treatment for Gout Patients who need help planning their uric acid lowering treatment. Also, it should be useful for GoutPal Seekers who are seeking the best type of gout treatment for themselves. But you should also look at Gout Pain Relief for Patients (Coming Soon). 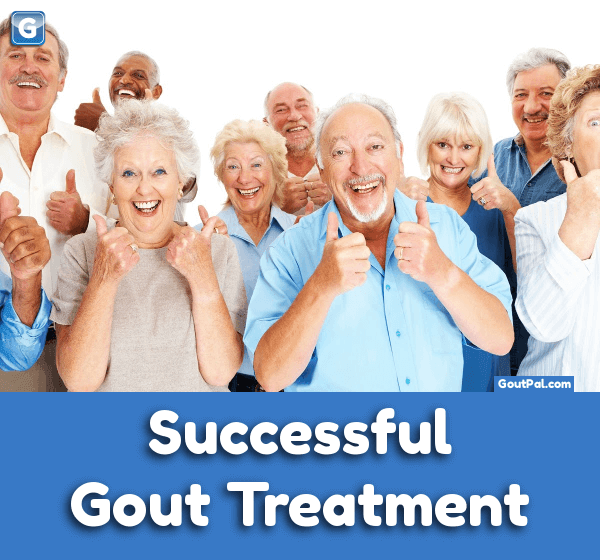 Because most gout patients need pain relief during the early weeks of uric acid lowering. Please remember that my labels for different types of gout sufferer are my way of organizing gout information for you. Because that helps you avoid irrelevant gout facts. Therefore, if you do not know your gout sufferer type, start with Questions for Gout Sufferers. But, you might prefer to be helped as an individual without labels. So, if you want personal structured help now, ask in the gout forums. Pre-Treatment Testing. Ideally, includes target setting. Starting Dose. With assessment of initial reaction and side effects. Increasing dose to get rid of old uric acid crystals (Titration For Debulking). Monitor Debulking to assess start of Maintenance Period. Decrease dose to maintain safe uric acid for life. Annual Gout Recovery Safety Check. I’ve expanded on these steps below, including references to further information. So, I suggest you read the whole plan first. Then return to each step and read the references. Gout Pre-Treatment should always include blood tests for uric acid, liver function, and kidney function. Also, consider a 24-hour uric acid excretion test. Then look at individual uric acid medications for other possible tests. When discussing blood test results with your doctor, it is best to agree on uric acid targets for the debulking phase, and for the maintenance phase. To explain, the maintenance target should be below 6mg/dL in all cases. However, 5mg/dL is increasingly common, as it provides a better safety margin. The debulking target is always lower, and ‘low as possible’ is a useful target if you want the fastest gout recovery. Most uric acid lowering drugs have a starting dose that is lower than the therapeutic dose. Because this allows your doctor to take blood tests. Then your response to low doses allows you to estimate your targets for the early months of uric acid lowering. So, you can schedule appointments with your doctor for the following steps. Side effects only affect a small percentage of gout patients. So, you should not expect them. But, if you feel bad symptoms from your uric acid medication, you must deal with it in a logical manner. Firstly, make a note of your symptoms in your gout diary. Then, consult your doctor. Also, consider false side effects. But, if you cannot tolerate your chosen uric acid lowering drug, there is usually an alternative. If there is no alternative, it is usually possible to start at very low doses. Then, make gradual increases until you reach a dose that will lower your uric acid below 6mg/dL. In this way, side effects become tolerable, allowing you to continue with gout recovery. This is one of the most misunderstood topics of gout management. Because you have built up uric acid crystals over several years. So, you have to get uric acid low enough to dissolve these old crystals. Until you get rid of most of that uric acid burden, you are at risk of a gout attack. As the most important step in your gout patients plan you work closely with your doctor. Because you need a series of blood tests and dose adjustments to reach your uric acid target. Then, those tests will tell you when your debulking period has finished. At this point, you slowly lower your uric acid medicine dose. Also, you can stop taking any gout pain relief. Gout recovery maintenance is the same for all gout sufferers who now control their uric acid at safe levels. Once a year you should organize blood tests for uric acid, kidney function, and liver function. Apart from that, just enjoy life. But also consider helping in the gout forums occasionally to encourage new gout sufferers. How will you manage successful gout treatment? Allopurinol (Zyloprim, Aloprim, Lopurin, etc). Febuxostat (Uloric, Feburic, Adenuric, etc). If you need help, please ask in the gout forums. I wrote my old gout treatment guidelines as part of my research into how I could manage my own gout. Firstly, I realized I had to take a logical 3-step approach of Symptoms, Treatment, and Diet. That approach was very successful for me personally. But, as I expanded to help other gout sufferers it became too complex. Therefore, I am reformatting most of my old gout treatment pages to be part of step-by-step plans. So, you will be able to personalize those plans to match your own unique situation. As you can imagine, this transition will take time. But, all the information you need is here for you, just not in the step-by-step format. However, it’s easy to find answers to your gout treatment questions. Because you can use my Google Gout Custom Search near the top of each page. Would you like me to email you when I publish more gout treatment templates? Leave Gout Treatment Plan for Patients to browse other Gout management plans. Perez-Ruiz, Fernando, et al. “Effect of urate-lowering therapy on the velocity of size reduction of tophi in chronic gout.” Arthritis Care & Research 47.4 (2002): 356-360. Lower Uric Acid for Faster Gout Recovery. How to Avoid Gout Medication Side Effects.